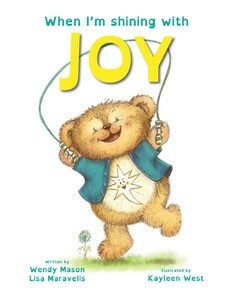 When I’m Shining with Joy is a young children’s book designed essentially to put a face to joy. The authors describe joy as a ‘stable emotion that is a deeper sense of contentment than happiness. Joy allows one’s true self to shine through’ and work through how joy feels like, and how you look with joy in your heart. On the flip side, it also describes what it feels not to have joy and how it can impact on your life - for example, “when I feel grumpy or sad/ then I just cannot see/ the light has turned off/ and joy fades from me”. When I’m Shining with Joy is all about teaching children to find the inner joy in themselves. It uses the descriptor of a switch within oneself and using it to turn on the lights to find joy again if life gets you down. The story is easy to relate to and a cute way to teach children about inner resilience. The imagery is also sweet and eye-catching; I think the use of bears was a nice touch to tell the story. This is fantastic learning tool for young children, and adults alike who may need a reminder to shine bright.